I can't get the Lee TL356-124-TC to dry cycle in a 1944 Walther P38. I've seated it from 1.195 to 1.120. It doesn't have a feed ramp. Curious if anyone else has run into this. I can't believe I'm the first person it's happened to. I run that boolit at around 1.07-1.08". The forward most micro band to the tip of the TC is showing out of the case. At 1.115-1.112" the top 2 bands would be showing. Maybe, try shortening the OAL. You have room for it. I can show pics if ya like. I use it in all my 9 mm. But not every bullet is for every gun. The p38 was designed for fmj round nose. Also the P38 was designed around Hot Nazi ammo like the Luger was. Lots of times they won't cycle unless the ammo is right up near the top. I load the standard lube groove version of that bullet. PC and sized .358" for a P38. For that boolit in that gun, it likes a length no longer than 1.085"
4.9 gr Unique cycles wonderfully. Edited to add that I sort brass for the thinnest, like FC. No good with thicker R-P, Magtech, PMC, etc. Re-edited again. Based on the photo, I'm referring to a different boolit, the 356-120-TC, so my COL will not be apples to apples. Last edited by Taterhead; 02-09-2019 at 09:56 PM. I like to test dry cycling with primer and powderless brass--(work the slide by hand to chamber and cycle rounds ). I do this to make sure the profile and OAL are OK for that gun before I think about charges or loading. -- Why load something that won't cycle in a gun. Last edited by Conditor22; 02-09-2019 at 09:37 PM. I have never tried the Lee TL356-124-TC in my Walther P38 , mine has a generous throat and generous chamber...every boolit tried so far would feed just fine . I don't seat my lead boolits out real far and size them .357 . If the boolit is jamming into the throat and sticking...seat it deeper of size it smaller . What are you sizing to ? Explain in detail what is happening... Saying "I can't get it to dry cycle " leaves way too much to guess at. What exactly is stopping the cycle...details matter . Photo's of rounds before and after attempted cycling will help even more . Doesn't matter if it cycle the other, it is "this P38" you are working with right now. In the bold above, keeping that in mind, see below quote bolded & perhaps, due to the very similar shape & weight of the two boolits, the 120gr. & the 124gr., since the firearm cycled the 120gr. TC as 1.076", then try the 124gr. TC at 1.076 " and see if it works at the length too. BTW, I have that 120 TC as well & IIRC, it is pretty close to the same dimensions as the 124gr. Really, try the 124gr at 1.070-1.080". I just think ya may be running a bit long at 1.11-1.12"
at 1.08 the microband is recessed into the case. none of these depths allowed the gunt o dry cycle. Hmmmm... I think ya may be right.. Likely due to the more extreme taper of the TC on that TL TC. My 120gr. TC is the single lube groove mold & it doesn't have that extreme taper to it. I do not have any of them(120 TC) left to measure, or take a pic of it, and will have to wait until I cast more when it warms up , or I could go measure the mold recess if you wanted the info, but that likely would not do you any good, since yours is the TL version. I took the TL356-124gr. TC (center in pic above) & placed it into the single lube groove 356 120 TC mold recess & its' taper is real close to just like the 124 TL in the pic is real close to the taper of the single lube groove TC next to it. Apparently your TL 124 TC has a more defined taper to it than the others. Something is odd though, as the comparison between your 124 TC & mine show a different taper to the cone it seems if ya compare the pics you have & mine. It may just be that you will just have to not be able use that particular boolit in "that" P38, I reckon, if it won't cycle thru all of that range of OALs. Bummer, but life is full of "bummers", it seems. Last edited by JBinMN; 02-10-2019 at 04:35 AM. OK... I figured it out on "my" end, I "think". The boolit on the right in "my" pic is the 120 TC single lube groove, not a 124gr TC single lube groove. But, the one in the middle of the pic I show IS a TL124 TC. But still, the taper on your pics looks much more pronounced than the ones I have, so I do not understand that.. Understand the "dry" but there are several phases to the "cycle"; feed, chamber, extract and eject. Thus "dry cycle" is a very broad description of the P38s functioning. 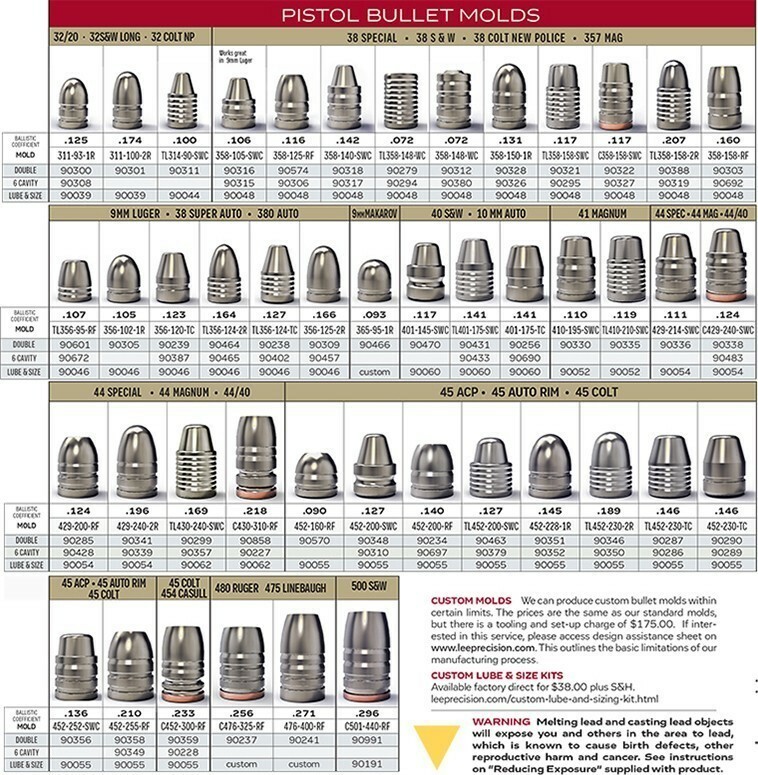 After PCing what are you sizing the bullets at? Larry, I don't know the correct term. what I meant be "dry cycling" is I worked the slide by hand and fed (tried to feed) the boolit from the magazine into the chamber. the P38 slugged out at .358 so I sized the boolits to .359. they past the plunk test in booth my Lyman handgun guage and in the P38 barrel. I drop the loaded cartridge directly into the camber and the gun will go into full battery and will dry fire (no primer or powder). PS, whats the technical term for cycling the slide by hand and chambering a new round? this profile just will not make the trip from the magazine to the chamber without jamming in the chamber mouth regardless of the OAL. I think this is a special order boolit mold, it's bigger and pointier than the TL356-124-TC, looks more like the TL314-90-swc. JB I see the confusion, the 356-120-TC worked fine and it looks like the TL356-124-TC probably would also. I think the "step" between the nose and the drive bands is where the problem lies.